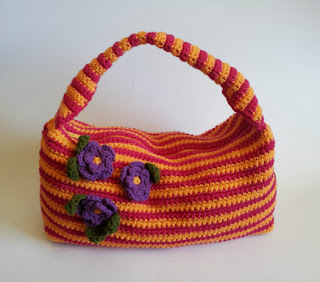 I was working on this striped bag, thinking that it would be perfect for pretty much everything I want to do this summer. It's completely made of cotton, and it's not so big that I feel like I'm going to give myself back problems if a quick trip to Target ends up in a crazy adventure at Disneyland, or the beach, or detours into a fishing trip. It measures 14" across, 8" high, and 5" deep. The strap drop is 14". I was almost done with it, and then I sold it. Crazy! My sister was watching me finish up the strap and then offered me designer-purse money for it. She could buy Coach for the price she offered me. She is a handbag snob. That was when I knew that I should write it up as a pattern. The purse is really that cute. Hmm... Guess I'm going to have to make another one for my summer adventures... LOL!!!! 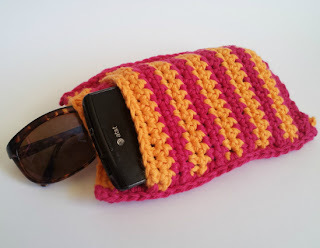 I wanted to throw in a little cute bonus for her, so I made a matching case for her sunglasses and iPhone. Finished measurements: 6.75" x 4.5"
Stripes are created by changing color every two rows. This gives a bolder stripe, and it allows you to work continuously without having to cut your yarn when you switch color. You can just carry the yarn up the side of the work as you go. You will only have to weave in four ends on the main piece if you use two colors. Or, alternately, you can make the case from a single color. R50: sc in each sc across. Continue in stripe pattern, beginning with the color that you started the main case with. R20: sc in each sc across. 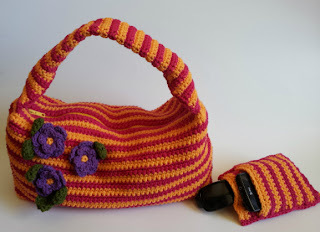 Sew the stitch loops of R20 of the Front pocket to R14 of the Main Case piece, matching the stripes. Single crochet both sides of the case closed, using one stitch per each row, going through all three layers when necessary. Fasten off. Weave in ends. Enjoy your new double pocketed case!! You could even use it to hold two pairs of sunglasses! Just wanted to stop by and say hello. I sometimes do not comment, but I do read your posts. Stay cool! Hi Charlotte! You just made my day! Have a wonderful weekend! I LOVE the colors! Your doing amazing! Thanks doll, you're doing amazing too! very cute and simple too. 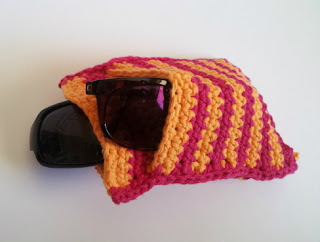 i was wondering if it would be okay to sell completed items of the sunglasses/phone case? Hi Liz! Thank you so much for such a wonderful compliment! Of course you can sell completed items!